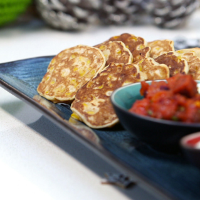 This a great brunch for when friends are over or fantastic as party food when entertaining. 1. Sieve the flour, baking powder and salt into a bowl. Make a well in the centre. 2. In a jug, beat together the egg and milk and pour into the well and whisk until you have a reasonably thick batter (you may not need to use all the milk). 4. Heat 1-2 tbsp. oil in a frying pan and spoon in tablespoons of the batter. Fry for a few minutes each side. Keep warm until ready to serve. 1. Heat the oil in a frying pan and add the onion and cook on a med heat until soft. Add the chorizo and the garlic, and get a nice bit of colour on the chorizo, then add the tomatoes and the puree. Season and cook until the tomatoes have softened and the sauce is coming together but still chunky. 2. Stir in the sugar and cook for a further minute. Stir through the coriander. 3. Serve warm, on top of the pancakes with a dollop of sour cream and an extra sprinkle of coriander.